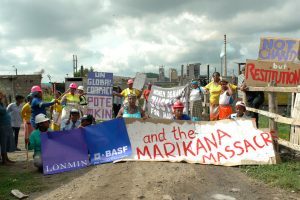 An international alliance formed by Plough Back the Fruits Campaign, London Mining Network, Amnesty International UK and others protested in front of Haberdasher´s Hall before they participated in Lonmin´s Annual General Meeting. The Rt. Rev. 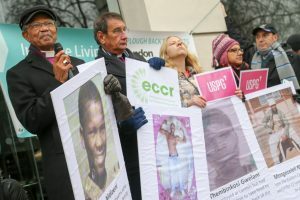 Dr. Johannes Seoka will join international solidarity groups in London, 26 January, to demand the UK miner meets its commitments for victim compensation and improved worker living conditions before 16 August, which will mark the five year anniversary of the police massacre which killed 34 miners in 2012.